Our morsel of the moment is Whittington’s Garlic Recipe Mesquite Smoked Beef Jerky purchased at the Love’s truck stop in Van Horn, Texas. Taste (B+): The first impression you get from this jerky is that it’s a bit bland… but first impressions don’t do it justice. This jerky has a mild, somewhat nuanced flavor that manages to deliver both a simple and tasty smoky flavor while also letting the natural beef flavor shine through. It takes a few bites to really let the flavor express itself and it is well worth it. That’s a mark of skill and it shows. Texture (A-): This is a really fun jerky to eat. Whittington’s has prepared the jerky in tiny little bite-sized bits that make eating it a bit of a novelty. The meat is tender with just the right amount of moisture. It’s easy to chew but you still get to work it a bit in your mouth. It’s cut across the grain and each piece seems to delightfully give way as you chew. Really, this is just very well done. Smell (B+): This jerky doesn’t sport a really strong aroma, rather its smoky garlic smell is low-key and inconspicuous. Still, it smells pretty good. You get a very good preview of the excellent flavor of this jerky with each whiff but it still leaves plenty for your tongue to find out on its own. 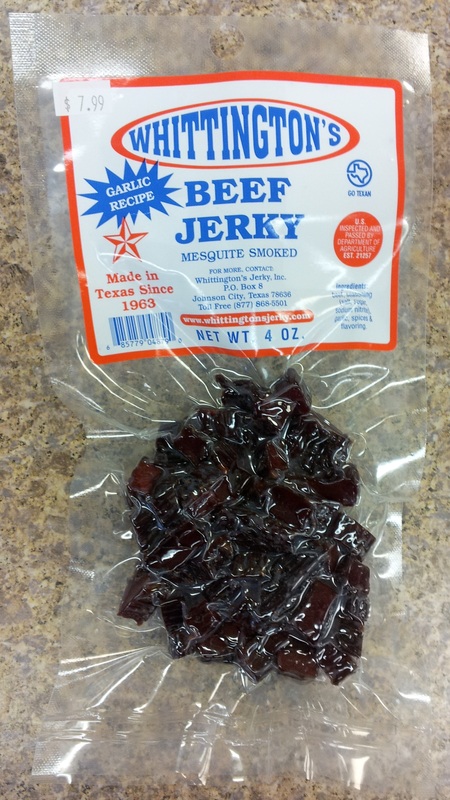 Appearance (A-): As you can see in the picture above, the jerky itself has a very distinctive looks resulting from the small bite-sized pieces being vacuum-sealed in a multi-faceted meat cluster. Admittedly, this is what first caught my attention years ago, teasing me into trying it for the first time. 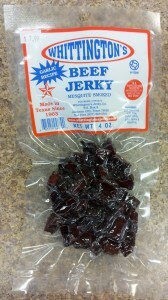 Once inside the bag, the jerky itself has an appetizing dark brown color and the grain of the meat is readily visible. Because the vacuum-sealing causes the pieces to stick together in a clump of sorts, you can break off a little or a lot of the meat as you go. Fun stuff. Consistency (B+): This is an expertly made jerky. The moisture consistency of this jerky is spot on. Bite to bite your experience is steadily great. There was, however, a bit of inconsistency in the strength of the flavor. With small bites you have a greater surface/mass ratio which generally allows you to flavor the meat more easily. While this was used to great result here, the size of the small pieces did run a bit of a range, and some of the pieces had a relatively weak flavor. This wasn’t bad by any stretch – they were all still delicious – but when you get the full-flavored bites the weaker ones really do stand out. Overall Impression (A-): Whittington’s had given us something to enjoy with their Garlic Recipe Mesquite Smoked Beef Jerky. The flavor is excellent, it’s fun to eat, and the tiny bite-sized pieces make this an outstanding treat. This is good stuff. Get some!